Eating right is essential for keeping your body healthy. This is as true for your eyes as it is for your heart. A diet that is rich in fresh fruits, vegetables and whole grains, and is low in saturated fat, can reduce your risk of heart disease. This will also keep your arteries healthy, so they can continue to supply your eyes with oxygen-rich blood. 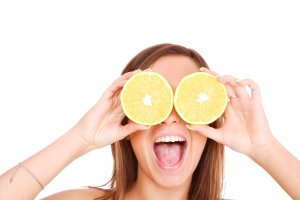 In addition to eating an overall healthy diet, though, some foods in particular are excellent for your eye health. Green, leafy vegetables. Kale, spinach, collards and other leafy greens are all high in lutein and zeaxanthin. These nutrients may reduce the risk of chronic eye diseases such as age-related macular degeneration (AMD) and cataracts. These nutrients are also found in broccoli, corn, eggs and peas. Cold-water fish. Salmon, halibut and tuna are all rich in omega-3 fatty acids, a healthy fat that may reduce your risk of developing AMD. If you are vegetarian, walnuts and ground flax seeds will provide some types of omega-3 fatty acids, but you may need to take microalgae supplements to obtain DHA omega-3s. Citrus fruit. Oranges, grapefruit, tangerines and lemons are all high in vitamin C. This antioxidant is essential for healthy eyes and may slow down the formation of cataracts and onset of AMD. You can also obtain vitamin C from other foods, including peaches, red peppers, strawberries and tomatoes. Legumes. Black-eyed peas, lima beans, kidney beans and peanuts are all rich in zinc. This mineral, which is found in the eye in high concentration, may help prevent your eyes from being damaged by light. Zinc is also found in lean red meat, poultry, milk and whole grains. Nuts. Almonds, pecans and other nuts are rich in vitamin E, a nutrient that may slow the progression of AMD and may prevent the formation of cataracts. You can also find vitamin E in avocados, spinach, sunflower seeds and whole grains. Carrots. Rich in beta-carotene, carrots keep your night vision working properly. This nutrient is also found in other orange-colored fruits and vegetables, such as apricots, cantaloupe and sweet potatoes. To learn more about protecting your eye health, contact us today.